A black-shanked douc photographed within Mondulkiri Protected Forest in Cambodia's Eastern Plains Landscape. 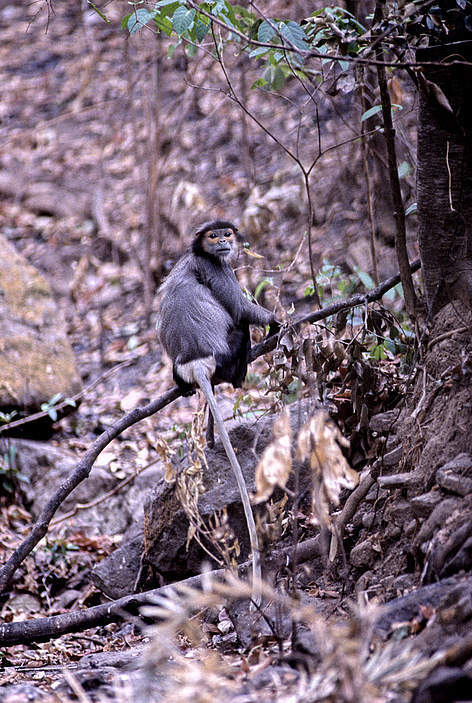 The black-shanked douc is one of the most striking primates with its distinctive black hind limbs and contrasting grey body and bluish face. Cambodia’s province of Mondulkiri probably holds the largest population of black-shanked douc in the world: In Seima Biodiversity Conservation Area alone, 42,000 individuals have been estimated to occur with additional smaller populations in Phnom Prich Wildlife Sanctuary as well as Mondulkiri Protected Forest, all within the Eastern Plains Landscape. Remnant populations also persist in southern Vietnam, although the largest population is estimated at only 500 to 700 animals. Another endangered species of douc, the red-shanked douc (Pygathrix nemaeus) has recently been confirmed from Cambodia’s Ratanakiri province, but the extent of this species’ distribution in Cambodia is still to be determined. All species of douc are endemic to Indochina and contribute to the outstanding biodiversity value of the region.